Ola! I am off for the evening but I wanted to get one more post out before I leave. 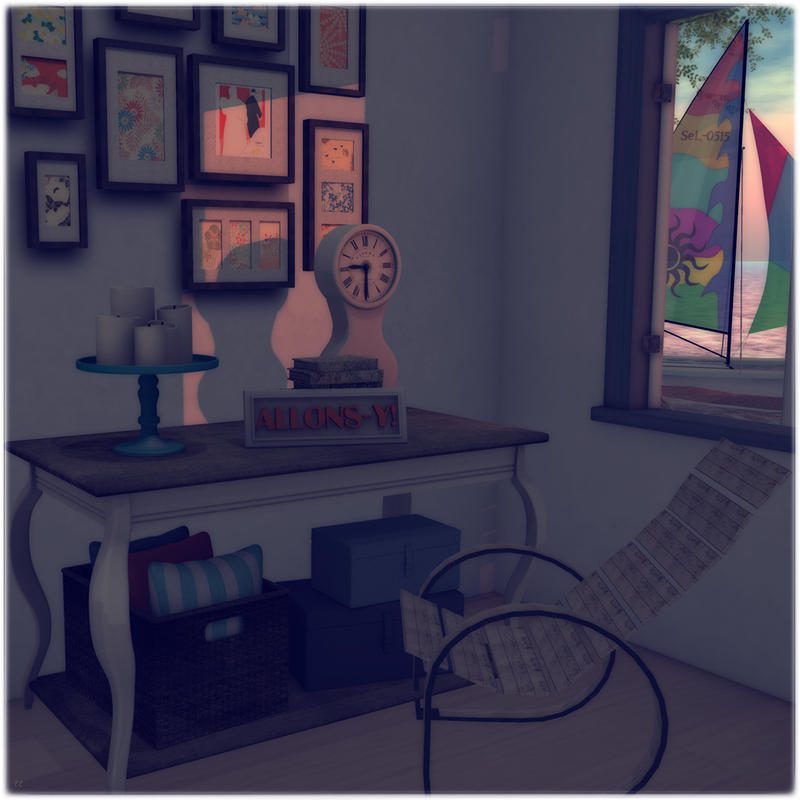 A collaboration of a whole bunch of goodies from The Liaison Collaborative and My Attic at the Deck, The Dressing Room Fusion and of course a little of Collabor88, and to top it all off a fantastic Pelee Island mesh Chair from Hanaya! I feel the island magic and so wish I had a pretty little spot like this in rl to go to right now! I am off with just a few words as I am tres tired, but I shall return……..until then enjoy the island magic and I will certainly……………………..
Ola! The past two weeks have just been a complete blur in rl, so I haven’t had much time to sneak into sl. I had a few hours yesterday to grab some photos before my internet went down for over 12 hours due to maintenance………….grrrrr Shaw………so I got to work immediately. The Liaison Collaborative has opened its newest round and boy are there some magnificent items to be had! The fabulous Tuscany set from 22769 [bauwerk] has many options to pick from. I am using the Rust Set but there is also a Black Metal Set as well, you can buy these with or without the fabulous cushions. You get the gorgeous Terracotta Mosaic Table, a Garden Bench, a Garden Chair, a Terracotta Cube with Plant and a Garden Amphore. This set also includes a Folding Screen and a Terracotta Pot with Boxwood Tree that are not shown. These pieces are all available separately too, so you can mix and match! The Tuscan Heritage Garden Walls are new from Collage, there are two different textures and they include the wall and post so you can design your own space…..I love these! Over at the Boutique you can find this very cute Poppy Seed hair from Milk, I simply love the texture of this new do. Haste has this fabulous little mesh Fringe Halter in different colors, I matched this beauty up with a pair of Metallic Glitter Shorts from Tres Blah that I hadn’t worn yet. I managed to get a little Easter into this shot, What Next sent out this very sweet Easter Cake with Chocolate Frosting to the VIP group, there is also a in-store version you can pick up as well. Yes, it’s Friday so that means another wonderful round of FLF! Today along with a few of my favorite things I am wearing the drop dead gorgeous Mokatana The Diva skin from Glam Affair and of course this amazing mesh Belted Pencil Dress in Teal from Girl Thursday, both available until midnight tonight for Fifty Linden Friday, so hurry and get there before these beautiful deals are gone! Ola! Back with more from The Liaison Collaborative. 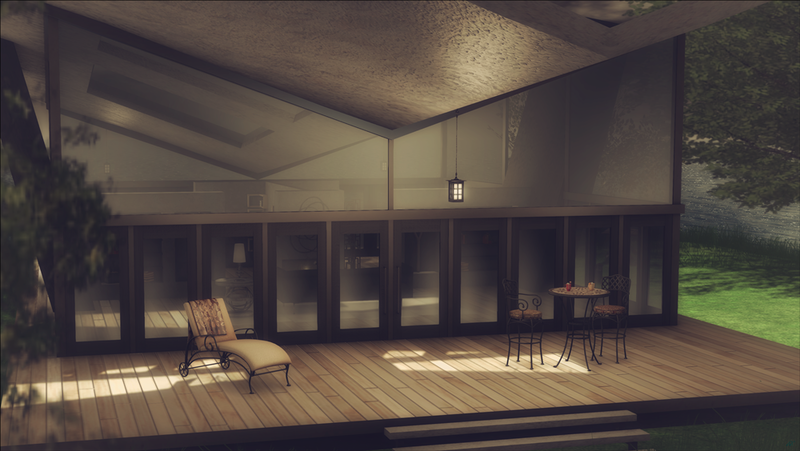 Trompe Loeil has this fabulous mesh Neoteric house out for this round and oh do I love this! The running water from the roof to the front porch is amazing, there are also built-in shelves to place all your favorite accessories on and working lanterns. I chose a night setting to show off this amazing build and added a few of my favorite new Pharos Garden Lanterns from Hanaya to illuminate as well. The windows and skylights are just as fabulous for those shadowed moments! Ok I am going on a posting run here, so I will return in two shakes with more awesome sauce looks. I feel really good to get back to some wonderful clothing from *TuttiFrutti* The beautiful Bela has an assortment of really sweet deals out at My Attic at the Deck…….. The Mesh Ana Shirt and Monika Mesh Jeans are some of my favorite things this round. There are an amazing assortment of designs to choose from, and when having a bad day these can only make you smile and really wish you could have this outfit in real life!!! I’ve paired them with the gorgeous Priscilla Plateau Heels from SLink, these must be worn with the new Mesh Avatar Advanced Mesh High Feet. I was surprised to hear in group yesterday that some didn’t even know these were available, so I am reminding you…..go grab these wonderful High Feet as there are shoes coming out everywhere from different designers using the Add-on Kits for them. I knew it wouldn’t be long before there were a multitude of Shoe Add-ons for these beautiful high feet and I am excited for each addition! If you are a designer and looking for the kit check out Siddeans’ Page over at SLink Style and apply there. I love Love LOVE the addition of SLink Add-ons. 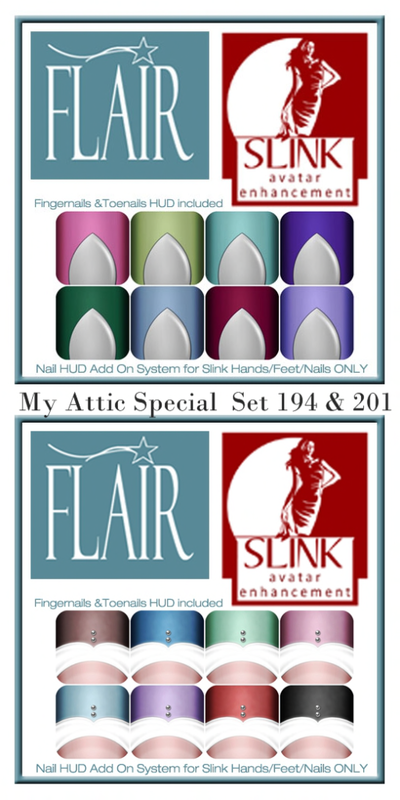 Which brings me to Flair, Sasy has some amazing new Nail Add-ons for SLink (av) Hands and Feet at this round of My Attic and I love them all……I am addicted to all her wonderful Nail designs and these are available for only 95L for two packs……twice the fun yes? I will be back after dinner to take some more photos……and now that I do not have to babysit my sump pump things will be a whole hell of a lot easier on my end lol. Desk: Second Spaces ~ Writers Block Desk & Acc. Ola! I am terribly sick, the kidlet and I have the worst flu so we are staying indoors and have taken over our large sectional and made it our home for the upcoming days. So I’ve decided to take a few days off to sleep, play some Jenga and veg in front of the TV with him.